PHOTO BY JACOB GURNEY Rescue personnel work to ventilate a barn fire at 10207 W. CR 10 Friday afternoon. 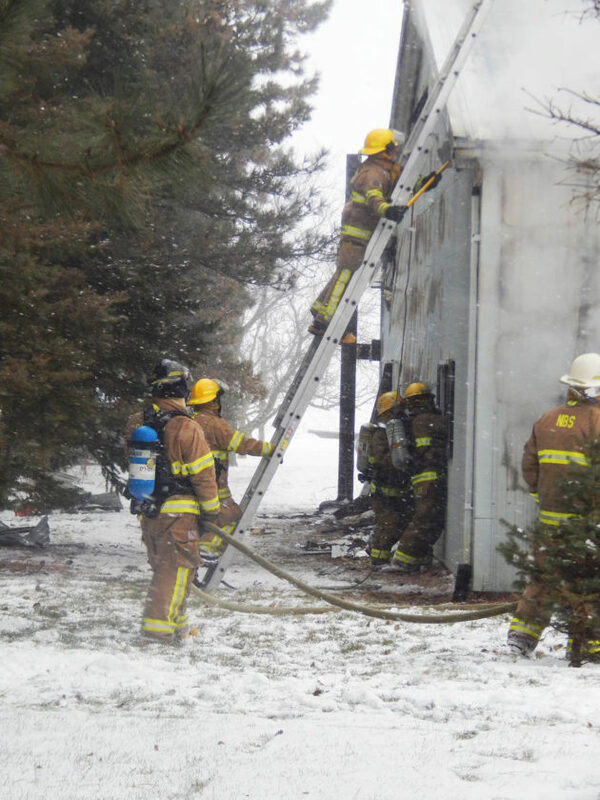 NEW RIEGEL — Local fire departments responded to a barn fire at 10207 W. CR 10 near New Riegel Friday afternoon. Chief Dennis Kessler of NBS Joint Fire District said when crews arrived, there was heavy smoke showing. It took crews about an hour to get the fire knocked down so it was no longer a danger, he said. NBS Joint Fire District was at the scene for about four and a half hours, spending the rest of the time peeling back steel and putting out hotspots, he said. The barn had steel-clad walls on both sides, meaning the exterior and interior had steel with wood in the middle, and that made fighting the fire difficult, he said. Kessler said an exterior attack was used until crews could get the barn ventilated by cutting holes in the walls. Then, they could get inside to fight it, he said. Around 15,000 gallons of water was used to fight the blaze. “The smoke conditions and the building construction were the biggest problems we had fighting this fire,” he said. Nobody was in the barn at the time of the fire and nobody was injured, he said. Kessler said the barn and the contents were a total loss and the loss estimate likely would be “hundreds of thousands” of dollars. “There wasn’t a lot of fire damage, it was mostly all heat and smoke damage,” he said. The property is owned by Eugene Wagner, but contents of the barn were owned by Wagner’s son, Kessler said. He said the cause of the fire still was under investigation Friday evening. The fire was reported at 12:19 p.m. and NBS Joint Fire District, Bascom Joint Fire District, McCutchenville Volunteer Fire Department, Sycamore Fire and Rescue, Carey Volunteer Fire Department, NBS EMS District and the Echo unit responded to the blaze.